Macro Man trusts that readers had a happy and healthy holiday season. He hopes that they'll excuse the lack of posting over the holidays, but he preferred to adhere to the maxim that it's better to remain silent and be thought a fool than to speak and remove all doubt. However, today marks the return to normalcy for punters and schoolchildren on both sides of the Atlantic, so it's time to get stuck in again. And getting the boot stuck in is exactly what's happening to the euro, what with the apparently imminent introduction of a Rubicon-crossing ECB QE program, as well as (yawn) another iteration of the Greek crisis. Between the farcical success of a bond auction last year and the subsequent collapse of the political will to support the financing of those bonds, it's another episode of the same old story in Greece. One wonders what the Greek is for "Groundhog Day"- ΓΡΟΥΝΔΗΟΓ ΔΑΥ? 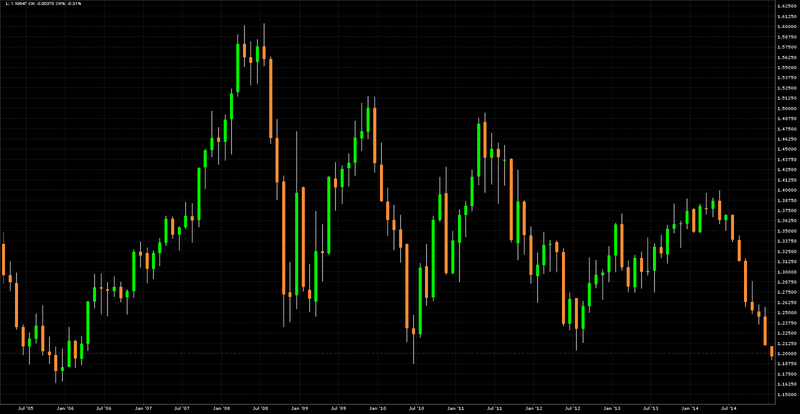 Regardless, EUR/USD has fallen six straight months and is working on a seventh already. The last time there was a streak that long (December '09 to June '10), the euro hit a low of around 1.1875 before ripping 30 big figure over the subsequent year- despite the ongoing travails of our Greek friends, amongst others. Of course, there was a little something called "QE2" that happened in the middle of that, which helped drive the dollar lower as a certain ECB president was almost literally hiking the Eurozone back to the Stone Age. Now, of course, the Italian leather moccasin is on the other foot- it's the ECB that's going all-in on unorthodox monetary easing as the Fed contemplates its first rate hike since Tony Blair lived at 10 Downing Street. Over the last decade, selling EUR/USD below 1.25 has generally been a terrible, terrible idea. Even in 2005, when the dollar had the previous Fed rate hike cycle and the Homeland Investment Act as tailwinds, China managed to arrest the decline by layering "your amount" bids in the mid-high teens. Something tells your author that they won't be in a positions to do quite the same thing this time around, given their own economic challenges. In sum, despite the fact that EUR/USD in in "Achtung!" territory based on the chart, the factors supporting its decline are as strong as at any point since the very early years of the current millennium. While it's true that some of those factors may well be in its price, it's equally the case that anyone with access to a chart is probably wary and unlikely to have a full-whack position size on- particularly given how troublesome the early part of 2014 was. While selling weakness out of the block might not be the greatest idea, running at least a modest short still appears to have considerable merit....just as long as you don't have Ned Ryerson on the other side of the ticket. EUR is due for a bounce, and so it oil. Welcome back, MM, and thanks for EURUSD thoughts. Not one of my best mornings here, but if I can emerge from the fetal position for a few minutes, it seems that Dollar Bulls want it all ways on Europe here and are losing their minds a bit. On the one hand, selling € on expectation of ECB QE, while also selling € on fear that Draghi will NOT do QE, not to mention selling € on Grexit anxiety and it will all go pear-shaped again, and finally selling € ahead of an imminent Fed rate hike. Not to put too fine a point on it, these can't all be true - as some of them are mutually exclusive, and some of them are clearly just not going to happen. Peripheral yields are not going to the moon here, in fact Spanish 10s are <2%. Abee, if you are expecting a big blowout NFP number on Friday, btw, I have some Jets playoff tickets on the 50 yard line to sell you. Agree on the (over)due bounce. LB - yes it can't all be true - however, the biggest tailwind to dollar bulls is reflexivity - the more it goes up, the more it creates the conditions for it to go up further. I really think the debate is about the degree of freedom - this market's folly has so far been in treating the dollar's rally as a love bite from equities - I think they will soon realize it is the first of many small pox scars. Sorry for that image - just couldn't think of a better way to express what I had in mind. washed, sure, no arguments on reflexivity. Ouch. Nico - nobody gets everything right, even you have been known to be wrong at times, as are most observers with strong opinions. I haven't really defended my mistakes, but pointed out the time frame on some investments is a lot longer than others. I am invariably early, which is why I start small, so most of the positions you refer to are relatively small "mistakes" for now, but may work out well over time. In general, it has long been profitable to invest based on the idea that almost all catastrophic events do not in fact occur. So, when the markets start to price in war with Russia, Grexit, collapse of the EU and nobody using petroleum-based products any more, one really has to start to look for interesting opportunities. The last few weeks have seen what Polemic would refer to as "towel chucking" in emerging markets, E&P energy, and now the € itself. Welcome to reality....EurasiaGroup sees weaponization of finance as risk for 2015 as Washington using fin dominance in important new ways. with regards to the recent fx moves in Europe, I am inclined to sell eurgbp, as the structural headwinds facing the UK pale in comparison to those facing the EU. Additionally, I think the best way to take advantage of the opportunities created by the oil selloff is to go long mxn vs other latam currencies. In general, the security issues are overblown in Mexico and the econ reforms are real. "In other words, just as slowly, the world is starting to grasp the bottom line: it is not the financial exposure to Russia, or the threat of financial contagion should Russia suffer a major recession or worse: it is something far simpler that will lead to the biggest harm for Europe’s countries. The lack of trade. Because while central banks can monetize everything, leading to an unprecedented asset bubble which if only for the time being boosts investor and consumer confidence, they can’t print trade – that all important driver of growth in a globalized world long before central banks were set to monetize over $1 trillion in bonds each and every year to mask the fact that the world is deep in a global depression." ...But people were worried that we'd have a trade war because of global weakness...hmmm. So we get involved in Ukraine, and Russia then responds, and we don't like it, and so we have a trade war anyway...in the middle of global weakness. US 30-year yield down to 2.61%. Would be the lowest quarterly close in history, below Q4 2008.
when do we hear about the 2015 version of Amaranth? So many tailwinds for precious metals miners. I'm nibbling on GDX with a couple other specific names I like. It's the oldschool metrics - production costs are dropping, demand is stable, and estimates are too low. I don't think you need to see gold/silver go up for this to work. Also look for increased NAV's / books per share as lower fuel costs work there way into production costs, making less economic mines workable again. delta does not a hard d sound make. more like a soft th. a hard d in greek is written with two letters, nu and tau. Abee, guesstimates of the oil cash production costs are pretty much all over the chart, but recall an article which said that basically all OPEC countries have lower cash production costs than any shale oil areas. It was guesstimating that 40% of shale oil is underwater below $60 and 90% below $50. The most expensive OPEC country on the other hand was a bit over $40. Who knows if this is true, but perhaps this could be used as a guidance where it's gonna bottom. In the short term it might still go lower than any factual cash production cost, which is needed to meet the demand but in the context of still increasing demand it doesn't seem plausible to think that it could stay below that factual cost. On the other hand, if I were Opec I just might implement a strategy where, after my shale competition fell out of the game, I would start to gradually increase production and grab the market share which they left behind. This would keep the pressure on the rest, when the weakest competition begins to buckle under the debt load and at the same time grab some more market share. Although there are ticking time bombs for both sides, i.e the oil countries need a better price to fund social budgets to prevent unrest, and the shale producers need better prices to meet their debt obligations, the OPEC countries just might last longer in the end and grab more of that void that is going to form in the supply side. In that scenario the price recovery would be very very gradual, to ensure that shale goes down - and stays there for quite a while. the only problem w/ the mkt share strategy, is that it requires these OPEC countries whose oil production is profitable at ~30/bbl, but whose govt budgets are completely unbalanced at these levels. what is happening is that Russia, Iraq, Iran, etc are actually producing more as the price declines to help offset the lower price/bbl and thus soften the blow to their social spending projects. China announced that a $1T infrastructure program will be accelerated, make that bearish for emerging markets and commodities if you can, but I think we are going to see a nice global squeeze in risk assets this week. Thanks for that that LB - here is a link to the original stimulus announced back in nov 2008. Punters may recall this pressed the reboot button on EM which were quietly swirling down the tube back then. Now - given Left's proven uncanny ability to spot a risky asset squeeze, I will take his comment quiet seriously - but, I will point out that this is not new growth but just re-distribution from the pre-existing 2014-2016 targets - I will also point out that sometimes a market's reaction to a news says much more than the news itself - when the previous news was announced in nov 2008, the EM/commodity complex immediately boarded a rocket ship. Today, it was enough to cause a 1.4% rally in the shanghai comp. Kuroda's shock and awe China style? We shall see. It's all there, Fed rate hikes, Spoos to the moon, Russia in ruins, commodity bust ad infinitum, EU in fulminant recession, gold bugs at the soup kitchen, US employment cracking on apace and USD riding herd over the globe. Nothing like looking backwards, eh? Needless to say, we anticipate giving this one a retrospective Knob of the Quarter award in April. A lot of these would be part of our non-predictions. Regards Mexico - would humbly disagree, security IS finally becoming a bigger issue. Ayotzinapa or Tlatlaya seem to be water shed moment. Seeing links between army / police / narcos so clearly has hit a nerve with the public... Likewise Peña Nieto's wife / govt ministers having to explain buying houses they cant afford on their salaries doesnt help... This govt is struggling. The economy isnt too clever either. Negative current account, budget deficit and poor growth even with negative real interest rates and the US firing. Doesn't look too clever to me. Path of least resistance seems to be letting the currency sell off further. Mexicans have seen plenty devaluation under the PRI govt.